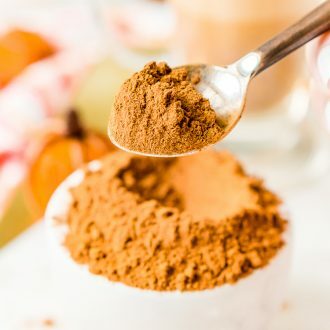 Pumpkin Pie Spice is easy to make at home with spices you already have on hand, it’s the perfect way to add additional flavors to your favorite pumpkin recipes! You may love pumpkin spice in your lattes, quick bread, and cookies, but have you ever thought about making it yourself? Sure you can buy the stuff, but you can just as easily mix up some Pumpkin Pie Spice with stuff that’s already in your cabinet! And if you have a fresh supply of Pumpkin Pie Spice on hand, you’ll find endless ways to use it. After all, as the fall air starts to turn chilly, there’s nothing like the nostalgic taste of cinnamon, nutmeg, and cloves. JUST TAKE ME TO THE PUMPKIN PIE SPICE RECIPE ALREADY! 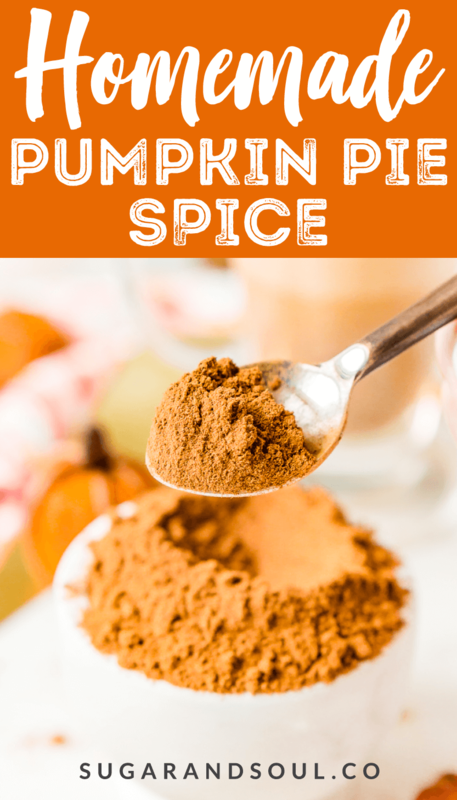 If you’d rather skip my (very helpful, I think) tips and tricks, essential cooking info, and similar recipe ideas – and get straight to this deliciously easy Best Ever HOMEMADE PUMPKIN PIE SPICE Recipe – simply scroll to the bottom of the page where you can find the printable recipe card. You can also use this recipe throughout the holiday season. Thanksgiving, Hanukkah, and Christmas are all occasions to enjoy this fragrant blend. Not to mention, this recipe really comes in handy when you realize that you ran out of the store bought mixture and you’re in need of a Pumpkin Pie Spice Substitute. Just throw together this easy version, and you can keep calm and cook on! 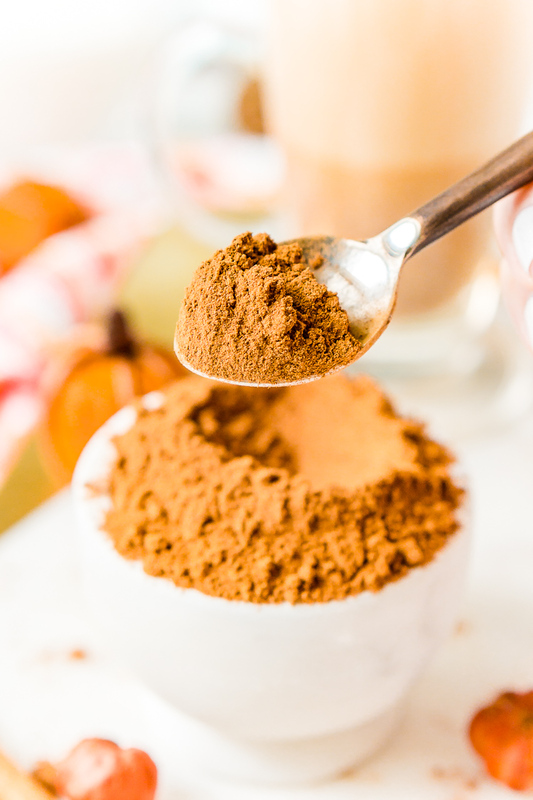 Homemade Pumpkin Pie Spice is a simple mix of 5 spices that are traditionally used in — you guessed it — pumpkin pie! It consists of varied measurements of cinnamon, ginger, nutmeg, allspice, cloves, and mace. If you don’t have mace (and we’re talking about the ground stuff, not the defense spray or medieval weapon), you can just substitute it for more nutmeg. Simply measure and whisk the spices together in a small bowl and store them in a spice jar. I recommend using a funnel to contain the spices as you transfer it to the jar. And to make sure your homemade Pumpkin Pie Spice stays fresh, check the expiration dates on each of the ingredients and mark the mixture with the soonest date. This combination of sweet spices can be used in more than just pie. Try adding a sprinkle to your coffee, oatmeal, pancakes, waffles, smoothies, and vanilla ice cream! Another little tip: a dash of Pumpkin Pie Spice tastes amazing on my Homemade Applesauce, and you can also use it to make this scrumptious-smelling DIY body scrub! 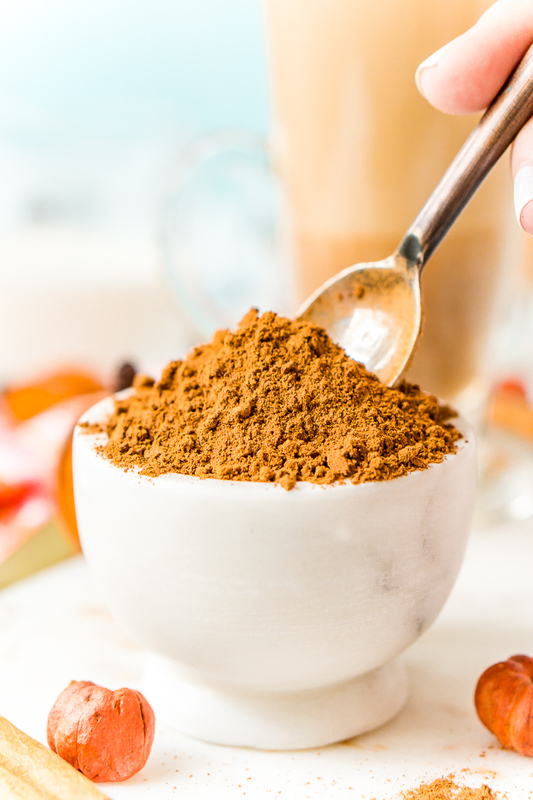 Fans of fall flavors will love this Pumpkin Pie Spice recipe to add seasonal flair to all your favorite snacks and desserts. Make it at home, and you’ll never have to worry about running out! More Pumpkin Recipes You’ll Love! I am currently working on perfecting a traditional pie crust recipe and will be sharing it and my recipe for Dutch Apple Pie in September, so keep an eye out for it! In fact, you can subscribe to my newsletter so you never miss a delicious recipe again! 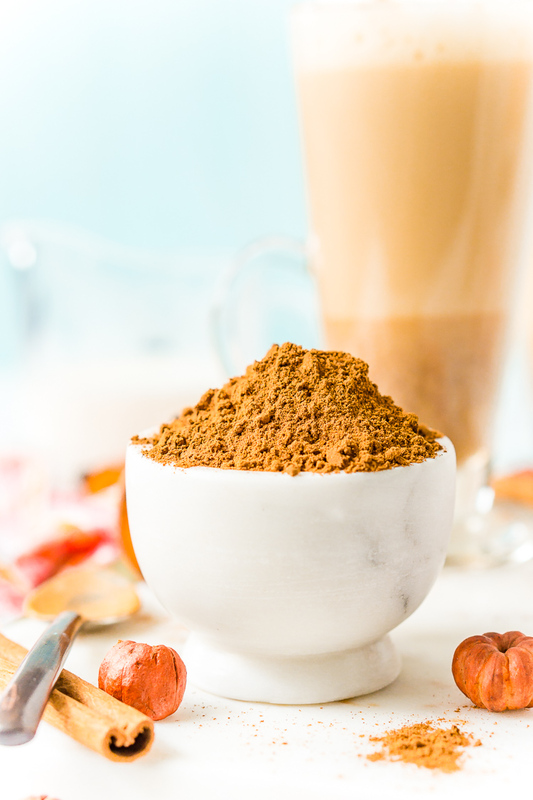 Pin this Pumpkin Pie Spice Recipe for Later! 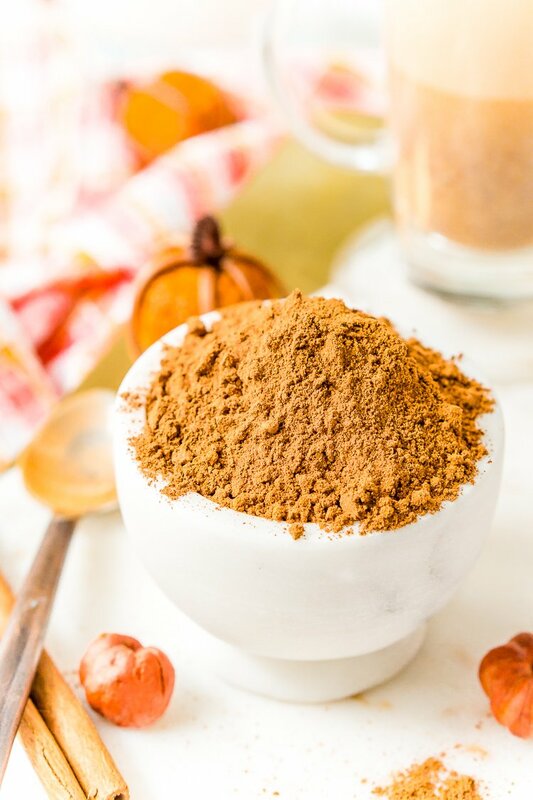 Pumpkin Pie Spice is easy to make at home with spices you already have on hand, it's the perfect way to add additional flavors to your favorite pumpkin recipes! Whisk all of the spices together in a small bowl and use a funnel to transfer to a small jar for storage. Check the original spices for expiration date and mark this Pumpkin Pie Spice with the soonest one. If you cannot find ground mace, you may substitute it with more ground nutmeg. I was just watching the news and they were talking about pumpkin spice. Made me want to run to the kitchen to make my own spice. Now I can thanks to your recipe! This blend is such a must for all my Fall baking! Totally doubling the batch next time – love it!